This is new post on PHP web development tutorial and this We have describe topic like How to store HTML Form data in CSV file by using PHP script. We all knwo CSV is a comma-seperated value file in which it stores tabular data in plain text format. It store one record in one line and for second record it will store in second line. We can also view this file data in spreadsheet format also and we can easily export this file data in excel also. This type of file mostly used for heavy data exchange. So, In this post we have make simple script for store contact form data in CSV file, So when some has come to our website and he want to send feedback to us then he can fill form and submit. When he submit form then that form data will be stored in CSV file which we have define in script and stored on our working folder or even you can also store on web server also. For make this type of system here we have use PHP script. We have use some PHP in build function like fopen() for open file for write operation, file() function for get file data in array format for count number of rows in file and fputcsv() function for write form data in csv file. So by using this in build PHP function we have developed simple system for storing form data in CSV file. Here we have store data CSV file because it is widely used in web development and it can be open in notepad also. It is light weight that means it occupy less space than other spreadsheet type like excel. So it is mostly used for data exchange. For example suppose in your web site your start one campaign and you want to received feedback from user and that feedback data you don't want to store in your website database, so at that time you can use this feature and you can store data in simple csv file and this data you can load on webpage also as per your requirement. 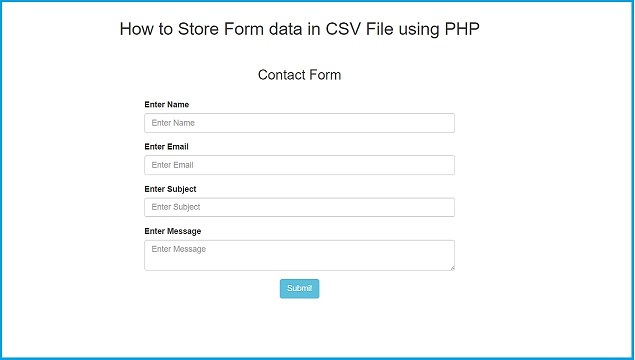 In short in this post we have discuss topic like how to store form data in CSV file by using PHP script. Is there any way to also add a fileupload?